Our emergency hospitals are staffed to handle a wide range of serious situations that require treatment - stat. Maybe this has happened to you: It’s 2 am. You hear a strange noise. You check it out. It’s your pet beagle. He’s in the living room surrounded by stuffing pieces from the sofa cushions. And he’s throwing up. A lot. Grab your sick pup and get him to a BluePearl 24/7 animal hospital. Our emergency hospitals are staffed to handle all kinds of serious situations that require treatment stat. When you arrive at a BluePearl animal emergency hospital with your pet, our highly trained veterinary team goes to work. First, they take your pet’s vitals and quickly act to stabilize him. Then, in many cases, they transfer him to a critical care specialist or criticalist. A veterinary criticalist has advanced veterinary training in crisis situations. When your pet needs them, they know what to do. At BluePearl, our criticalists have access to specialized equipment and technology to help them diagnose the problem and point to a solution. 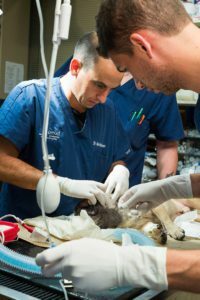 During the time your pet is in a crisis situation, the BluePearl support team will keep a watchful eye on him in one of our intensive care units. These ICUs are designed for your pet’s comfort and safety. But they’re also hooked up with sophisticated diagnostics and monitors, to track oxygen levels, electrolytes, blood sugar and more. When it comes to managing your pet’s health crisis, we’ve got a whole team behind him. In addition to the criticalist and vet technicians, at most BluePearl hospitals, we have other veterinary specialists who may step in after diagnosis. These specialists include cardiologists, oncologists, veterinary internists and others. 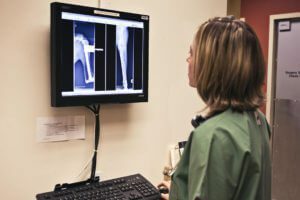 Our team also works closely with your primary care vet to ensure your pet receives continuous monitoring and stays on the road to recovery.